When I started climbing I was so desperate to get out there that I would rope up with anyone who had a pulse and claimed they could belay. I picked up partners in campgrounds, parking lots, even on the internet. Once I picked up a partner at the Lover's Leap campground. While we were sorting gear at the base of the route this guy, who I had met about 30 minutes before, said, "Well, I guess we should have that conversation". "Oh, you mean that anchors are good and we should build them?" These "one night stands" were always just that. I rarely, if ever, climbed with the person again, and often enduring the other climber's personality was the price I paid for getting out that day. I'm sure they felt the same. Good partners know when to keep it light. Vic and Josh on El Capitan. Now I'm not so desperate for partners. There's an active crew of folks in the Eastern Sierra and finding a partner for the next day can be as simple as sending out a few text messages. If I want to spend the day by myself in the mountains that's an option too. I can afford to be more discriminating. Now when I seek out a climbing partner the friendship and camaraderie are as important a part of the equation as whatever climbing we might do. It's hard to enjoy that friendship and camaraderie when I can't see or hear my partner, so I make a point of staying within an easy conversational distance when possible. I also travel in the mountains with others as a professional mountain guide. I am legally and morally responsible for the well being of those I'm guiding. I can't be doing a very good job if I can't see them. Obviously there will be exceptions to this when we're pitching it out, or when I need to range ahead momentarily to scout the route. But while hiking and on approaches and descents I stay near my clients both for practical reasons, like pointing out the best footing through a talus field, and for personal ones. The folks I spend time with as a guide are usually pretty interesting people. They come from all over the world and do all sorts of interesting things when they're not hanging out with me. I also believe that the job of a guide is more than just that of rope monkey. Many of my colleagues refer to their clients as guests. People who hire us are our guests in the mountains and we are responsible for more than just delivering them to the top of a peak and then back to the car without injury. So I'm in the habit of staying near my climbing partners while scrambling and hiking. I see many recreational climbers that are not in this habit. 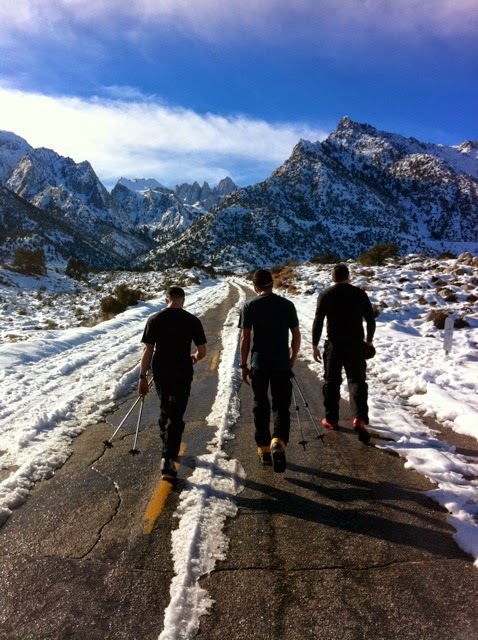 Recently I was guiding a couple up the Mountaineers Route on Mount Whitney. A party of two on skis was ahead of us on the approach and we saw them start up the East Buttress. We saw them again, beginning their descent as we were starting up from the notch 500 feet below the summit. This was a lot of snow and some 4th class rock and they were in rock climbing shoes. Rock shoes are far from ideal footwear on steep firm snow. We had ice axes and crampons and were glad for it. One of the two was clearly much more comfortable on that terrain and soon outdistanced his partner by several hundred feet, a distance at which they could only communicate by shouting. He waited for 25 minutes at the notch for his partner to catch up and then set out again, this time putting much more distance between the two of them. Several times I watched the second climber descend very slowly and carefully, with much trepidation, his partner nowhere in sight. I can only imagine how nice it would have been if the first climber had waited, maybe to point out some better footing, give him some advice on technique, or at the very least to show some solidarity. The challenges the second climber faced, descending wintery terrain with consequences in smooth soled flexible rock shoes, he faced alone. It makes the first climber seem callous. Why even bring a partner at all? Of course I was only witness to a small part of their day. They obviously had different skill levels for the terrain they were on. Perhaps they had agreed that once they unroped on the summit there was no need to stay together. I doubt they even had a conversation about it. If one person is just moving faster that day, is that a good reason to leave the other far behind? Going out into the mountains or even to the crag with someone is more than just going for a stroll. We refer to these people as our partners. Where else is that term used? Police officers use it to refer to their coworkers. People use it to refer to their spouses. Some responsibility and care is implied. What does it mean to be a good partner? Is there even a hard-and-fast answer? It came to my attention today that others have thought/written about this, albeit in a more funny way. Check out this post (http://semi-rad.com/2011/11/am-i-hiking-too-fast-for-you/) by Brendan Leonard at Semi-Rad.com.